The Aurora is caused by electrically charged particles emanating from the sun (often referred to as “Solar Wind”) colliding with atoms the earth’s upper atmosphere. These collisions cause the upper atmosphere to glow, creating shimmering sheets and whorls of colour. Because the earth’s magnetic field tends to concentrate these collisions toward the poles, the Aurora is most often visible in higher latitudes. The strength of the Solar Wind, and the Aurora that results from it is tied to the 11 year cycle of sunspot activity, and 2014 is very close to a peak. Photographing the Aurora is actually pretty easy, predicting it is by far the hardest part. Several web-sites can provide some help. If you live in Europe, www.aurora-service.eu is about as up to date as you can get. 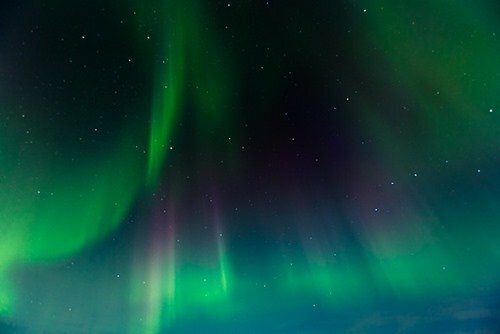 In Canada, www.aurorawatch.ca , and in the US: auroraforecast.gi.alaska.edu and spaceweather.com can provide some guidance and information on current conditions. In the field you need to find an area with the darkest sky possible. Light pollution from city lights or even a full or partial moon, will significantly diminish the impact and intensity of any aurora that may appear. This isn’t easy if you live in an urban area, but it’s worth thinking about, and taking the trouble to drive in to the country away from city lights. 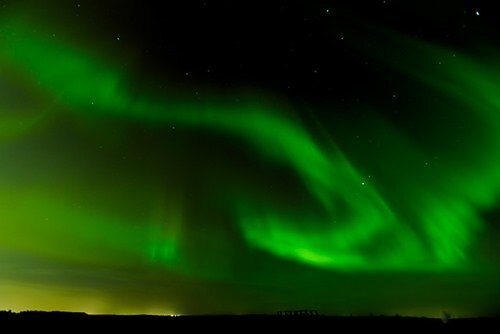 You may not need to be too far out of town to notice an improvement in the intensity of the aurora colours; the images here were shot within a few miles of downtown Reykjavik, Iceland in mid-September this year. A wide angle lens: as wide as you have, and at least 24mm (full frame equivalent: 16mm for APS-C cameras). Faster is better here, a 24mm f/2.0 or 1.4 would a good choice. A 16-35 f/2.8 zoom is perhaps even better since Aurora tend to fill the entire sky, and a truly wide angle will allow you to capture more of the display. Your lens should be focused at infinity, but do not rely on the infinity marking on your lens barrel. Particularly with zoom lenses, the marked infinity focus point may not coincide with the actual infinity focus point at all focal lengths. To be sure you have are focused on infinity, you need to actually focus on a distant object. This isn’t always easy, given that you are out in the dead of night. Pick a distant city light near the horizon, or pre-focus before it gets dark and tape the lens barrel down to prevent any focus shift. Barring this you can use live view (with the LCD image zoomed all the way in) to focus manually on a single star in the center of your image. Your exposure meter will be little use to you in these situations, but exposures of 15 to 30 seconds, f/2.8 at ISO 1600 to 3200 will likely all produce usable images. The main issue here is to select a shutter speed that will be short enough to prevent the images of stars appearing as ovals or streaks. As odd as it sounds, an exposure too long for the focal length you are using can result in stars recording as distinct ovals, rather than points. The formula to determine the maximum exposure for a given focal length is to divide 500 by the focal length in millimeters. So for example, using a 16 mm lens on a full frame camera, your maximum shutter speed would be about 30 seconds (500 ÷ 16 = 31). With a 24mm lens this would drop to about 20 seconds. If you are using a reduced frame APS-C camera, then you will need to divide your result again by 1.5. So for example, an 18mm lens on an APS-C camera would result in a maximum shutter speed of 500 ÷ 16 ÷ 1.5 = 21 seconds. This is pretty much the same result for a 24 mm lens on a full frame camera, which makes sense: both lenses have the same field of view on their respective cameras. In the end, chasing the Aurora depends on doing a bit of research to predict when one might appear. It also depends on a bit of good luck. The results are well worth it.